KYC (Know your Customer) is a new menu available exclusively in LEAP that helps you de-risk everyday business by instantly flagging potential risks related to your matters and allowing you to easily conduct additional due diligence searches. Or, please log in to your InfoTrack account to begin your verifications. The KYC menu runs preliminary background screening for all your matters at no cost and displays automatic alerts to notify you of any potential red flags, changes in company name or required checks related to the matter. Once turned on, the KYC menu is visible at the top of each matter through the 'Searching & Services' tab. 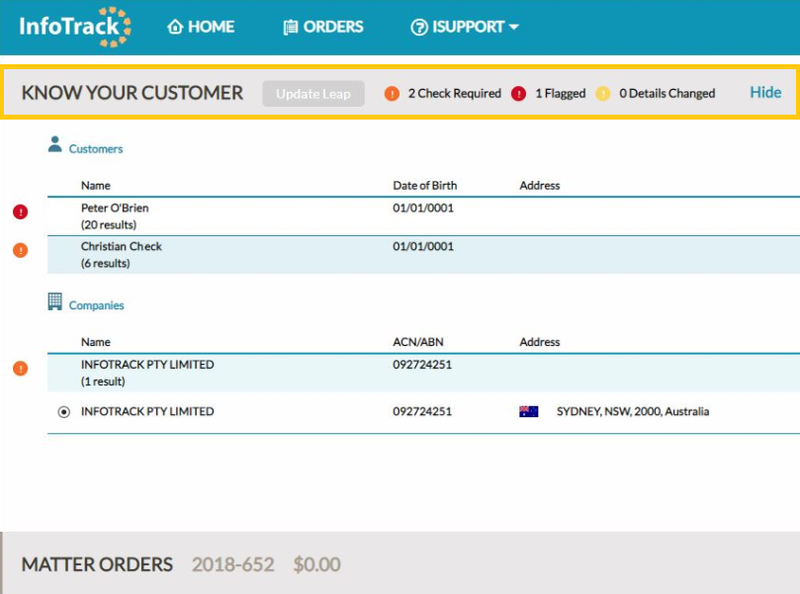 When you expand the KYC menu, you'll view a list of all the people and companies associated with the matter and see which additional information is available to order including ASIC, Banned & Disqualified, Bankruptcy, PEPs & Sanctions, and more. As usual, all searches and related cost will be saved directly back to the matter. Indicates whether any due diligence checks have been completed on the person or company. Alerts you if any potential negative records have been found (PEP & Sanctions, bankruptcy, etc.). Alerts you of any changes to the company name and allows you to automatically update LEAP. Want to learn more about KYC? If you're an existing InfoTrack client and you're keen to start using the KYC menu for your firm, simply get in touch with your InfoTrack Account Manager or call or email our HelpDesk at 1800 738 524. If you don't have an account yet, simply fill out the form below and we'll be in touch soon.